The time has come once again. The time where the fashion police get the weekends off and people all around take advantage of their vacation by avidly seeking the ugliest sweater they can find to flaunt around in public like an Olympic gold medal. It is ugly sweater season, and with Flyboost, you can use this trendy fashion trend to your advantage. Before we get into that, you may be thinking “What is the big deal with ugly Christmas sweaters” anyway? Wearing an ugly Christmas sweater has become one of the hottest trends around the holidays in the recent years. 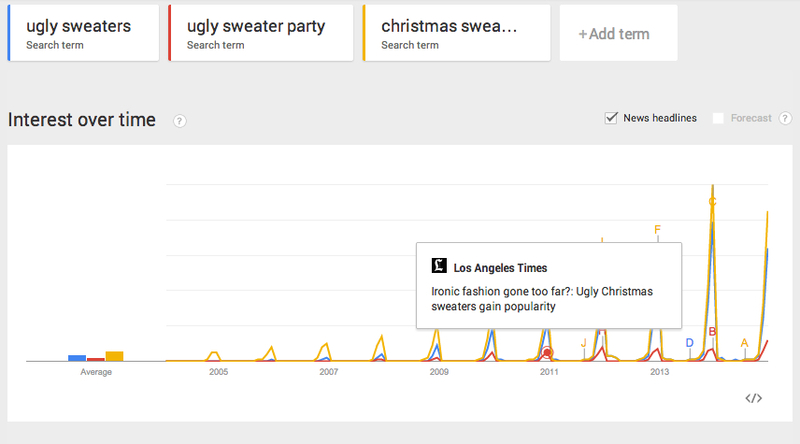 When looking at Google Trends, you can see that since 2004, the search volume for “ugly sweaters”, “ugly sweater party”, and “christmas sweaters” has increased substantially! Now, ugly sweaters are the center piece of most holiday themed parties. Almost everybody has been invited to one, and most people have gone to one. At its recent inception, the easiest thing to do was dig into the closets of your parents or older relatives to find the dusty piece of fabric. However, due to the growing popularity of ugly sweaters, now you see actual companies selling them successfully. The company Tipsy Elves are an online based store that sell different types of ugly sweaters, ranging from holiday themed to college sports teams. They aren’t the only ugly sweater company popping up and making a profit off this popular trend during the holiday season. Recently, Flyboost was featured at Union Jacks, a well known bar in Columbia, Maryland. 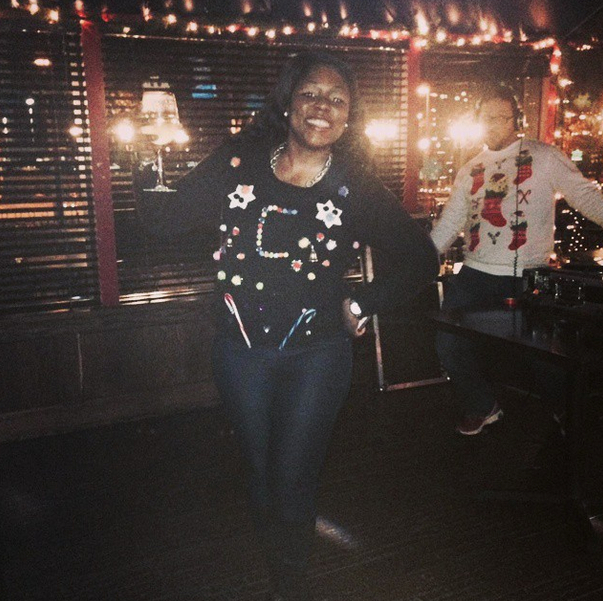 The DJ and manager decided to throw an “Ugly Sweater Contest”, in which the winner would receive a $50.00 cash prize. People came out to show off their ugliest holiday sweater, and then found out that by taking a picture of it they could win a $50.00 cash prize! Needless to say, the boosts started to fly in. The incentive for people to interact with Flyboost grew by the minute, which in turn kept people sticking around for more rounds of drinks and fun. After a close competition, a winner was finally crowned! As you can see in the picture, the lovely lady was ecstatic. The DJ, venue, and customers all converged onto one surface, which was social media. Flyboost was able to give Union Jacks a little extra push for the holiday season, which helped increase their revenue and fun that night. Although it is important to note that the benefits of the ugly sweater contest didn’t end there. The days of club promoting photographers have passed us. With smart phones becoming more and more capable of taking high quality pictures, all the photos you need of your venue and patrons are now associated with one hashtag and can be accessed publicly on Twitter, Instagram, or Facebook. With Flyboost, everyone is a photographer and you don’t need to hire one. In fact, promotion in general is now free because with Flyboost, these pictures/messages don’t just show up on the screen, they show up on the Internet too! Many Twitter and Instagram users link their profiles to Facebook, allowing the content of your establishment to bleed out onto three of the most popular social networks every time a new boost comes in. Better yet, now you have the ability to converse with your patrons and hear back from them. Also the venue owner, DJ, or manager does not have to set your contest prize at $50.00 like we did. You can make it whatever you want! Maybe your establishment is known for their witty t-shirts and you want to use that as a prize. It could be a gift card or free round of drinks you give out. You know your cliental better than anyone so you can decide! So whats next? Well if you are utilizing an ugly sweater contest for the holiday season, the next thing your venue is probably doing will be hosting a New Years Eve party! Flyboost is once again being used at Union Jacks for NYE, along with many other locations. 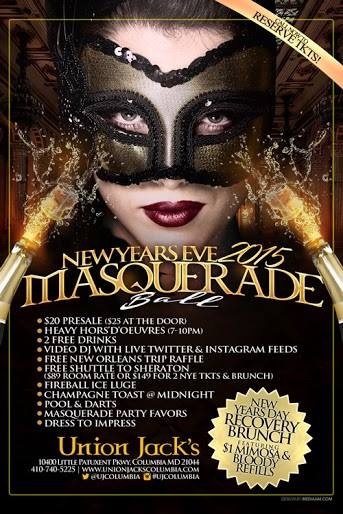 The promotional poster for their NYE celebration featured a section which says “Video DJ with Live Twitter & Instagram Feeds”, so people know that they will be able to experience their 15 minutes of fame once more, and possibly have a shot at another contest! Are you reading this post too late to run an actual ugly sweater contest during the holiday season? There is good news, because you can make a contest for any holiday! And not to mention, having a Ugly Sweater Contest for Christmas in July could be a fun idea to consider! Let Flyboost help get your venue reach to the next level. Become interactive with your customers and entertainment. Give people a reason to stay, and additionally give them a reason to come back next time. With Flyboost, everybody wins!